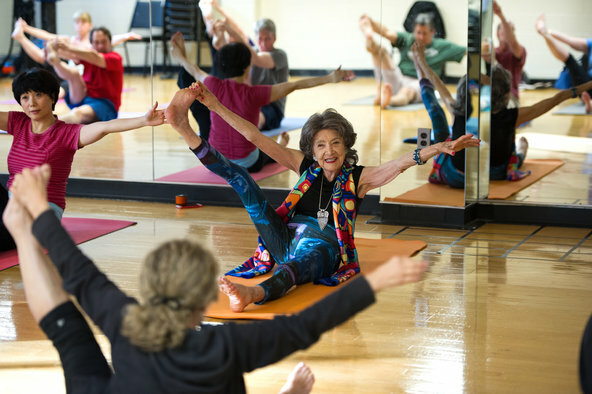 Tao Porchon-Lynch, 97, breezed into her regular Wednesday evening yoga class in a brightly colored outfit: stretch pants, sleeveless top, flowing scarf and three-inch heels. She put down a mat, folded her long, limber legs into a lotus position, and began teaching her zillionth session. Softly, she guided the 15 or so students through stretching and strengthening moves, and meditative breathing. The group, at the JCC of Mid-Westchester in Scarsdale, ranged from rank beginners to 20-year veterans of Ms. Porchon-Lynch’s classes, which she has been teaching for decades. She walked the room, adjusting poses, as her students shifted from dog to cobra to camel. Ms. Porchon-Lynch herself moved through the poses with no apparent effort. At one point, she suspended herself above the floor, supported by her arms. “Feel your whole body singing out, and hold,” she instructed. “The ladder of life will take you to your inner self,” said Ms. Porchon-Lynch, who said that before the class, she had knocked out two hours of ballroom dancing. “I did the bolero, tango, mambo, samba, cha-cha and, of course, swing dancing,” she said. After the class, she slipped back into her heels — modest height, by Tao standards. Six-inch stilettos are more her speed because the lift helps the flow of energy from the inner feet up through the body, she said. Back at her apartment in White Plains, she pointed to a photo of herself being dipped dramatically by a dance partner in a competition. “I’m very silly. I haven’t grown up yet,” she said. Then she sat and described her “I was there” life story, a march through history that rivaled a Hollywood film. She said she was raised by an uncle and aunt in Pondicherry, India, after her mother died giving birth to her on a ship in the English Channel in 1918 toward the end of World War I. At age 8, she began practicing yoga when few women did, and she traveled widely as a child with her uncle, a rail line designer. Her father, she said, came from a French family that owned vineyards in the South of France, and she moved there as World War II approached. She and an aunt hid refugees from the Nazis as part of the French Resistance. In London, she entertained troops as a cabaret dancer, and after the war she began modeling and acting in Paris, she said. She spoke of English lessons with Noël Coward, and hobnobbing with the likes of Marlene Dietrich and Ernest Hemingway. She had stories about marching with Mohandas K. Gandhi and, years later, with the Rev. Dr. Martin Luther King Jr. and attending demonstrations with Charles de Gaulle. Ms. Porchon-Lynch said she had studied yoga over the years with prominent teachers such as Sri Aurobindo, Indra Devi and B. K. S. Iyengar and taught yoga to many actors in Hollywood. Even after three hip replacement surgeries, she still drives her Smart car daily and travels widely to teach yoga. Ms. Porchon-Lynch, a longtime widow with no children, attributed her longevity to keeping her vortexes of energy flowing with “the fire of life,” and waking up each morning with the positive attitude that each day will be your best. Five hours of sleep a night is plenty, she said. “There is so much to do and think about,” said Ms. Porchon-Lynch, a lifelong vegetarian and a wine enthusiast who still enjoys imbibing. Finally, she talked them through a wind-down period of relaxing meditation.